My dad loves his tablet. He's always checking email, watching videos, and catching up on Facebook. So for Father's Day I thought it would be fun to make him a little screen cleaner to wipe away the fingerprints. 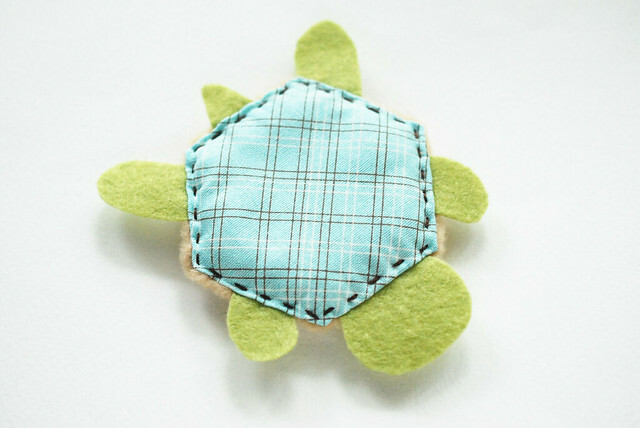 And I couldn't resist using English paper piecing hexagons and making it into a turtle shape. Dad's like turtles, right? If you or your dad need to clear away the smudges on your phone, computer or tablet, why not make one...or a few? These definitely aren't fiber-free so they may leave a few bits of lint behind. But they are super soft and will wipe away dust and fingerprints. 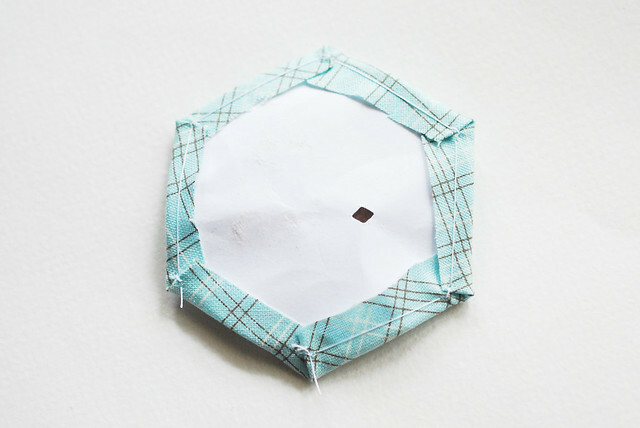 Use the 1-1/2" hexagon template in the PDF to make a hexagon (see my tutorial here). It seems a little strange to do this with fleece, but it works. Just make the seam allowances a little larger and be careful to avoid stretching as best as you can. 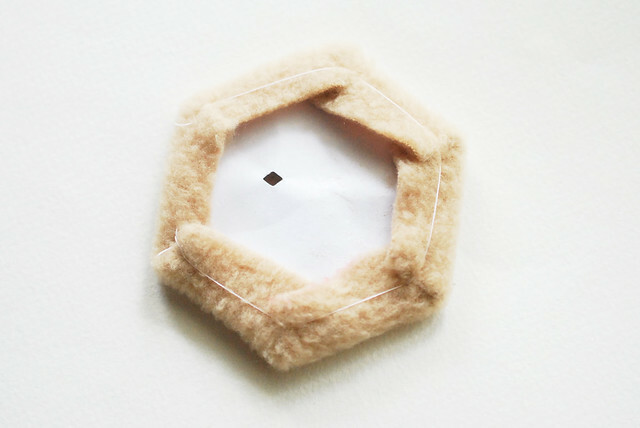 Cut a fleece hexagon that is just a bit smaller than the hexagon template. 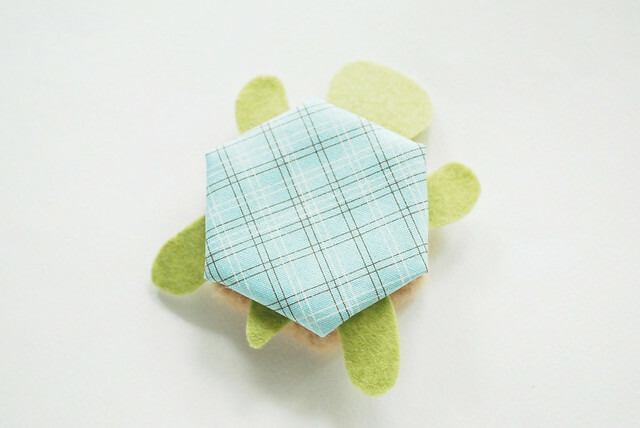 Cut a hexagon from fabric that is about 3/8" larger than the template. Center the fleece on the back of the cotton hexagon. 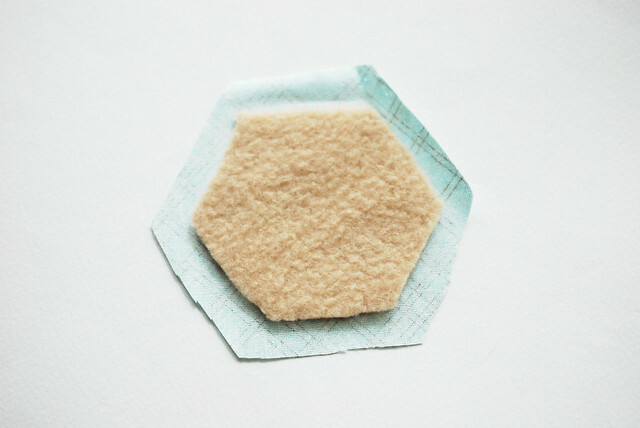 Lay the paper template on top of the fleece and baste the hexagon as you normally would. 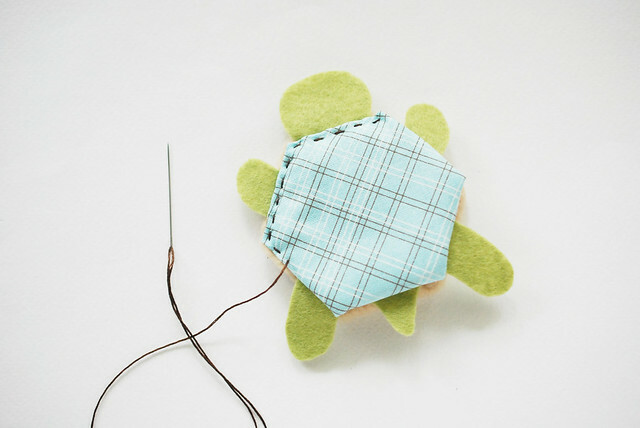 Cut out a turtle body from felt, then remove the papers from the hexagon "shells". Make a turtle sandwich! Place the felt body in between the shells, with their wrong sides facing. 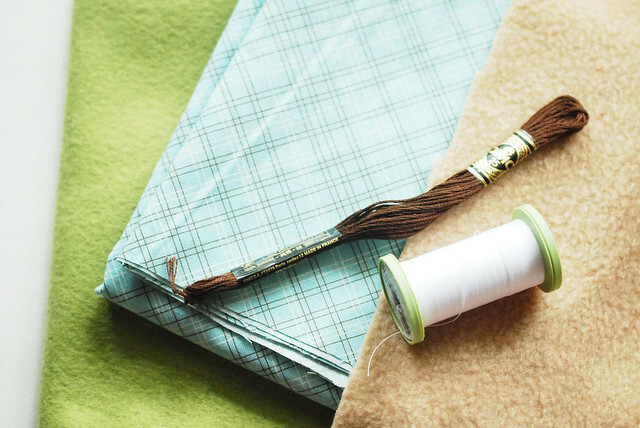 Thread a needle with three strands of embroidery floss and stitch around the hexagon with running stitch, hiding the knots between the shell layers. Can I just tell you that it felt very strange to make something like this and not put a face on it? It did. And yet, no face seemed like the right choice for this one. 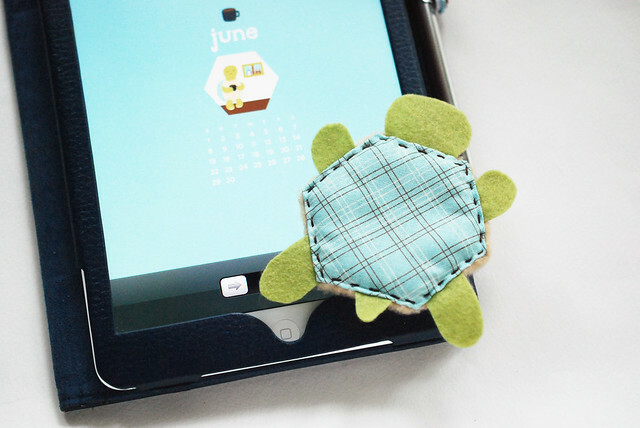 Now this turtle is ready to rub his belly all over the screen and clean it up for you! 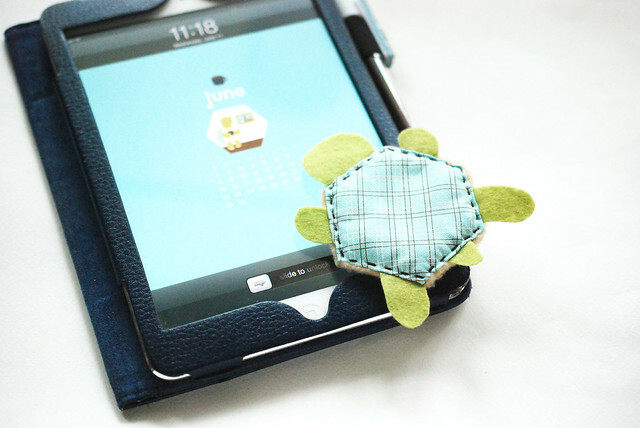 And now that I've made this little guy, I do believe that I need to make more screen cleaners, or maybe some other little critters that use fleece hexagons. They are just too fun, too soft, and too cute! How cute is this?! Thanks for sharing! oh my goodness! i love love love love love this!! what a great idea! This is adorable - thanks for the tutorial! I can think of several people that I could make these for...nobody likes a smudgy screen. Such a brilliant idea! I love this! Love these as I do all your projects! Dad might need one and everyone else! Really cute, and so simple. Hope your dad likes it! I'm so excited by your fleece hexie. I've wanted to make some! Off to experiment. Very cute! Would a microfiber belly work as well... although it is not as 'fluffy'. It may need padding. Microfiber probably would work! You could either add batting to that layer, or fatten up the turtle with stuffing! Aks everyone! I'm so glad that my turtley friend is loved! Oh my goodness, you are the most clever-est person! This is *adorable*! Ohhh so cute and clever. Would be great for the kids as well. I need to get some microfiber now! My dad is an artist and loves quirky things. He also cleans his tablet screen way more than I do! Your could also make this without the turtle body layer for a more basic version. Gorgeous, thank you for sharing. What a fun little project! So doable, thank you for sharing the directions. This is darling!! I am doing like 5 swaps rightow and looking for little trinkets to include and this is absolutely perfect!! This is a great idea. I love it!!! this is so cute, my grandkids would love it. Now, I just need to find a turtle shape or even just an outline for the turtle, I am not one that can draw. LOL!! If you download the PDF, there's a template you can use...then you don't need to draw it yourself! My mother comes into my room today. "Are you. . .paper piecing?" Your turtles are being created in FRANCE!! by women bloggers. Congrats for a great idea. 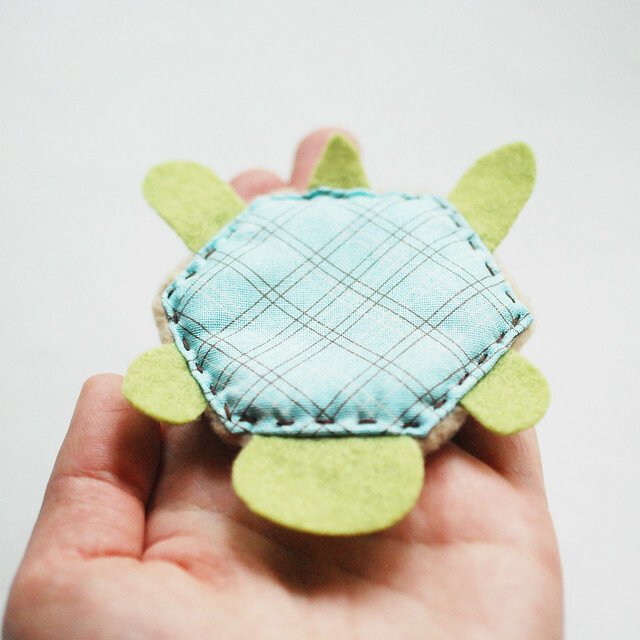 so enjoy my turtle, pleas can I take the instructions to share with a craft group that meets in our local library? 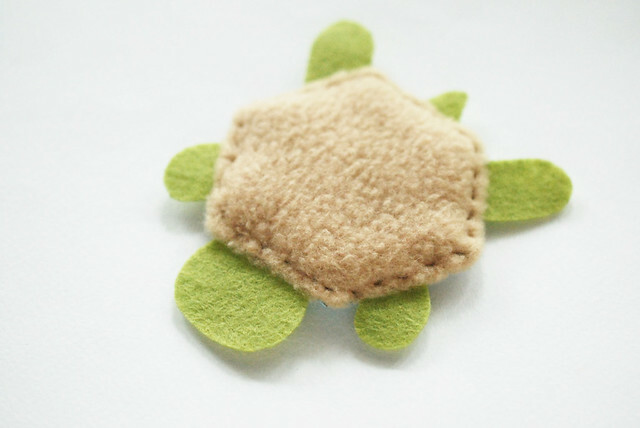 I tried making a sample turtle last night, using a microfibre cloth, and mine turned out a lot messier-looking than yours. (I don't know what I was thinking--I didn't even manage to keep the print on the fabric straight.) Any tips on keeping it all together nicely while you work? I haven't worked with microfiber, but I know it's pretty slippery. My only suggestion is WonderClips. They should really help hold things as you stitch. BTW, Anonymous: I love that comment about your mother asking if you are paper piecing. Cute! I'll have to make one of these for myself. The only fleece in my stash is fusible, but I'd think a hexagon shaped piece should work, and could even be fused in place. I think I know why no face seems appropriate for this little guy. The normal orientation of a turtle has you seeing the back of his head - no face there. Since the turtle body is flat, as opposed to 3D like a real turtle, you don't have any side of the head to work with either. So your top view of the turtle is spot-on.